First impressions count! 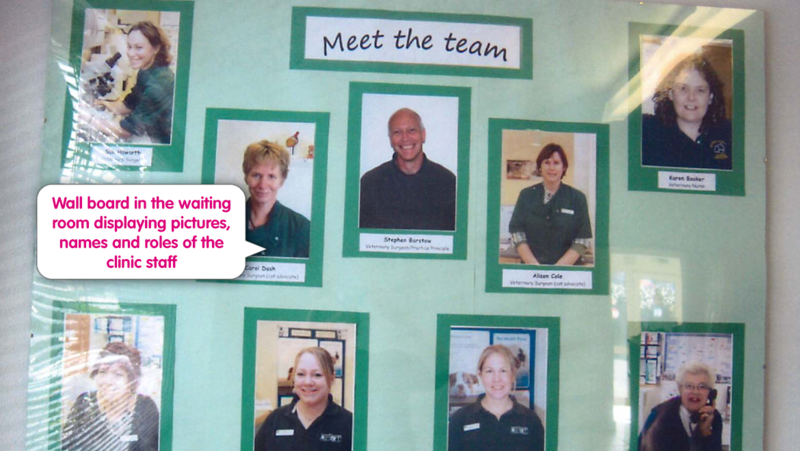 The reception staff, the waiting room and/or the reception area are the first things clients encounter when they attend the clinic. 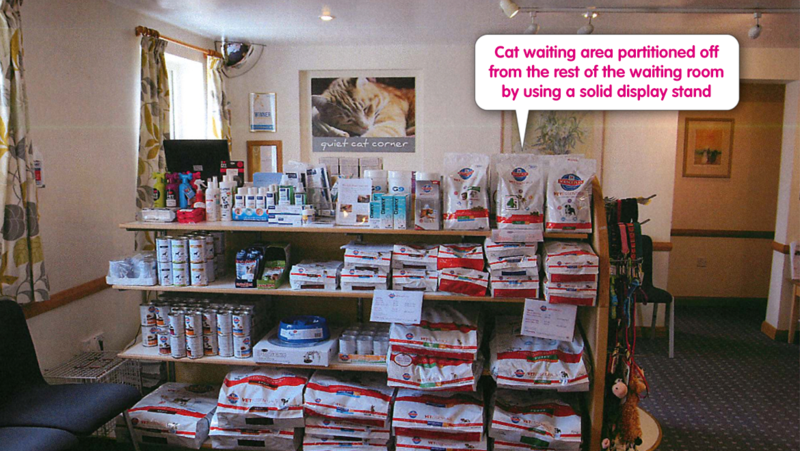 For cat clients and for cat welfare it is critically important that this is not overlooked. 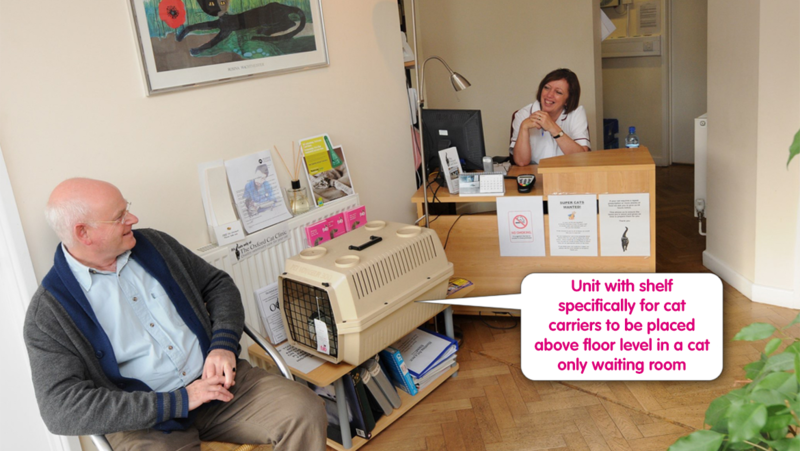 If consultations take place at the veterinary clinic, it is vital that there is somewhere for clients to sit and wait with their cat, and this should be large enough and have sufficient space and seats to meet the usual clinical caseload. 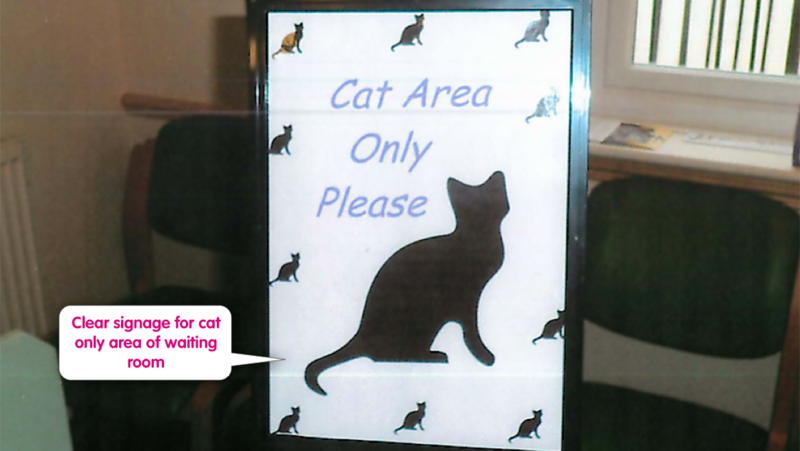 There are very important additional considerations when it comes to cats and cat clients in the waiting area. 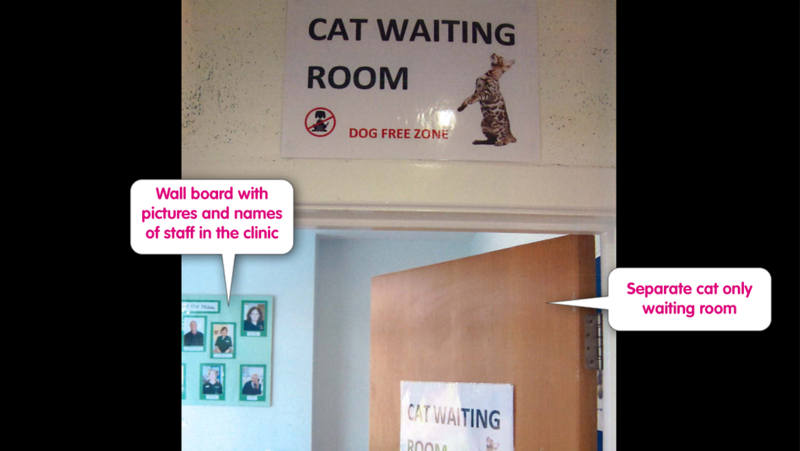 Cats will inevitably be anxious and stressed in the waiting room as they are outside their normal territory and will feel particularly vulnerable. Fears, anxiety and stress will be heightened if cats are placed next to, or have eye contact with, what they would regard as a predator species (eg, a dog) or have to share the space with barking dogs. Further, cats feel more vulnerable at floor/ground level as their natural instinct is to find a vantage point higher up where they can rest and observe in relative safety. Cats also need to be protected from each other – they are not naturally social animals so direct eye contact between cats should be avoided, and there needs to be effective sneeze barriers to help prevent spread of infectious diseases. 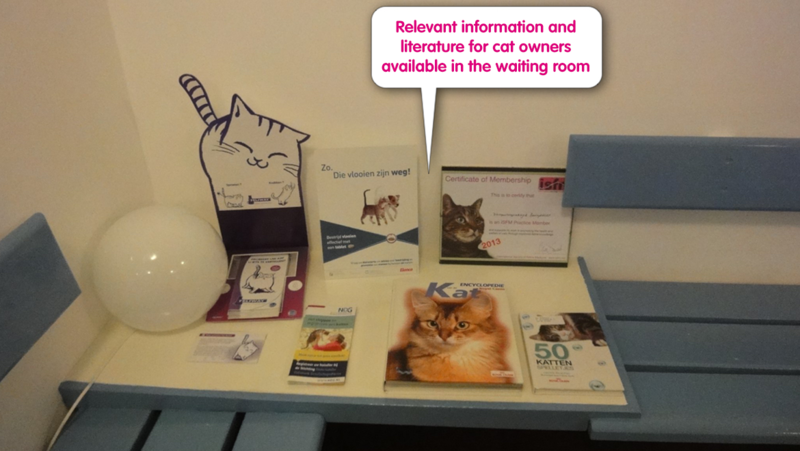 If there is no possibility of making structural changes to the waiting room in any way, Cat Friendly Clinic criteria at the Bronze level can be met by offering blocks of consultations for cats that are at separate times from those offered to dogs. 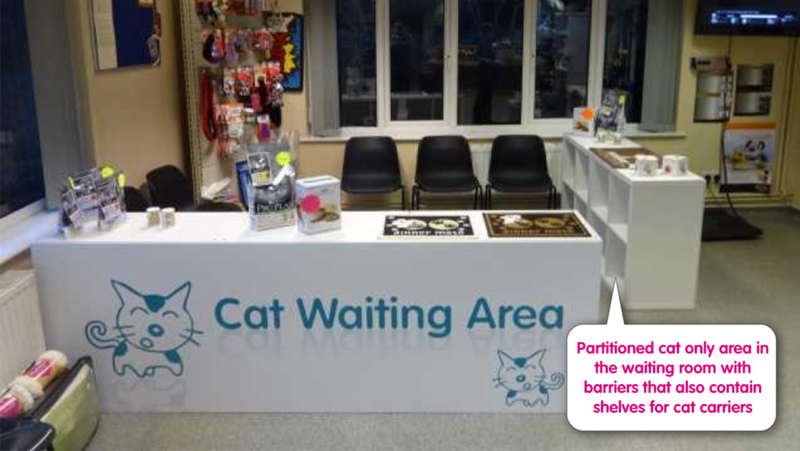 To meet the Bronze criteria, this would require cat-only consultations at least on a daily basis, and these would have to be used routinely for cat consultations. 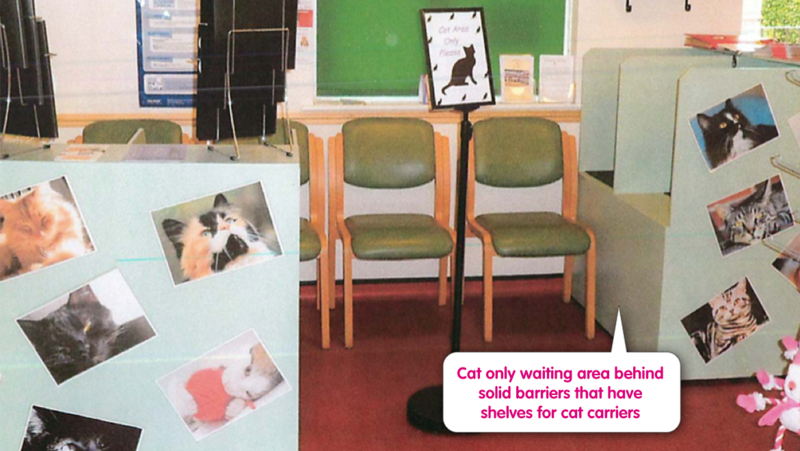 In most cases, creative use of the waiting area can meet all the needs of a Cat Friendly Clinic. 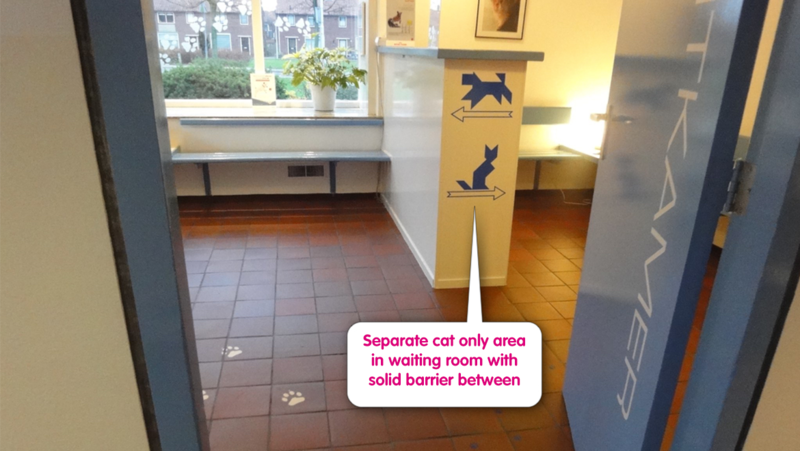 We regard segregation of the waiting room, with a dedicated cat area, to be important, because even with dedicated cat consulting times it is often hard to avoid having dogs and cats in the waiting room at the same time. 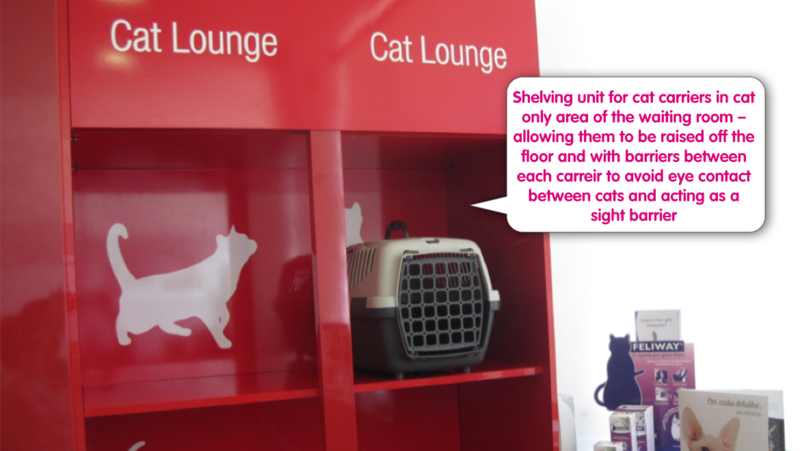 The first principle is therefore to have separate areas for dog clients and cat clients. 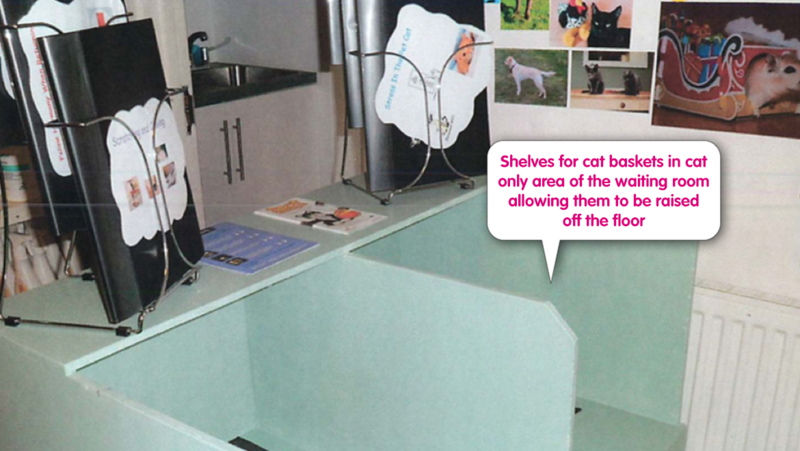 These two areas should be separated by a sight barrier to prevent cats seeing dogs and vice versa. 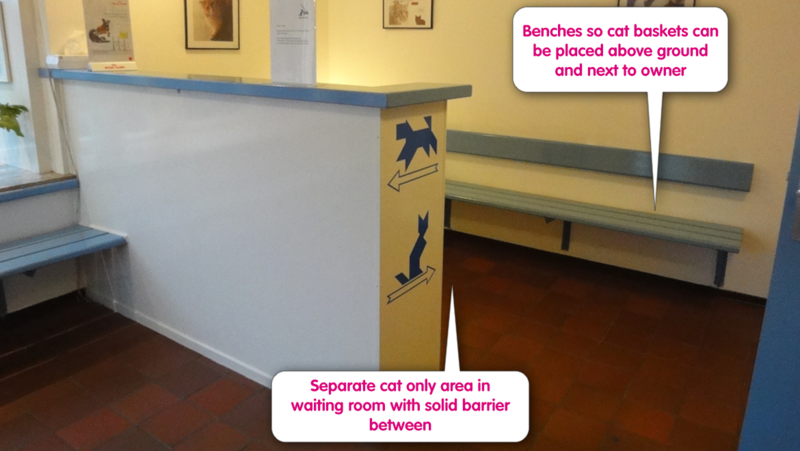 In some clinics there may be a permanent barrier (eg, a wall) between the dog and cat areas of the waiting room, but that is not the only solution. 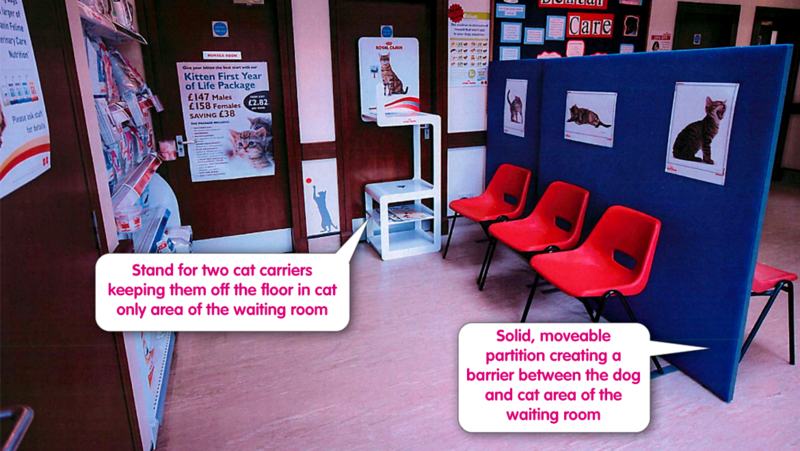 Some clinics separate the two areas with a temporary or semi-temporary barrier or partition – this could, for example, be in the form of a wooden or metal barrier, or even a barrier composed of densely potted plants – anything that separates the two areas and prevents eye contact between dogs and cats. 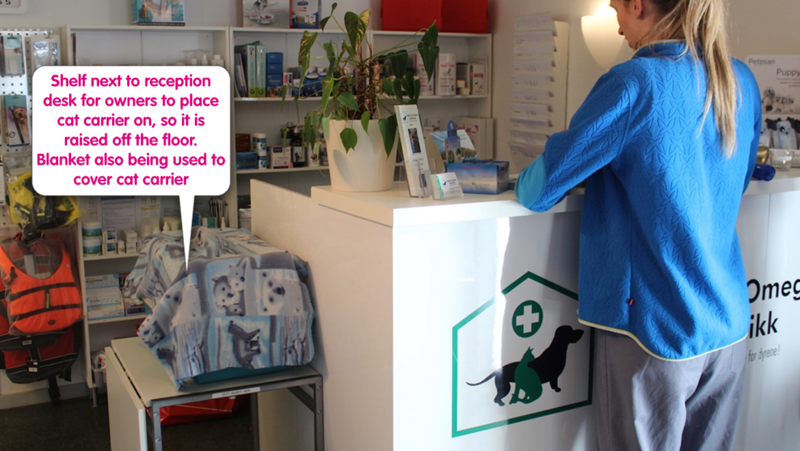 The clinic should also take measures to keep dogs quiet in the waiting room, and perhaps have a separate room for noisy dogs or ask owners of noisy dogs to wait outside the clinic until they can be seen by the vet. 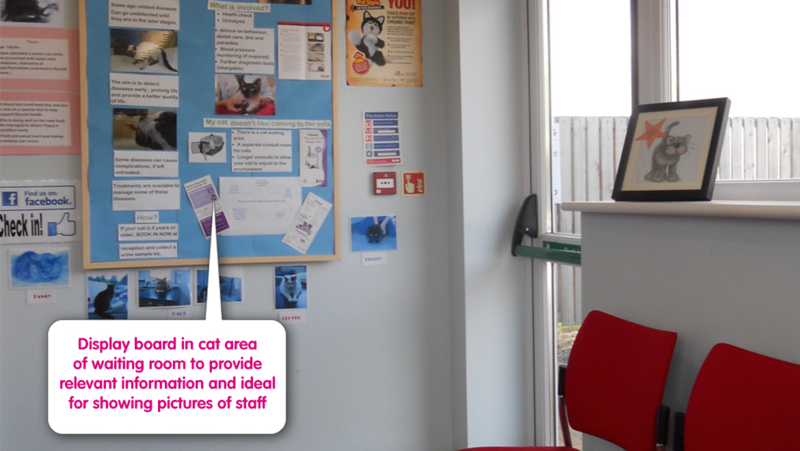 Ideally the cat waiting area should also be situated in a way that reduces or minimises contact with dogs or passing by dogs when cats come in and out of the clinic or move in to a consulting room. 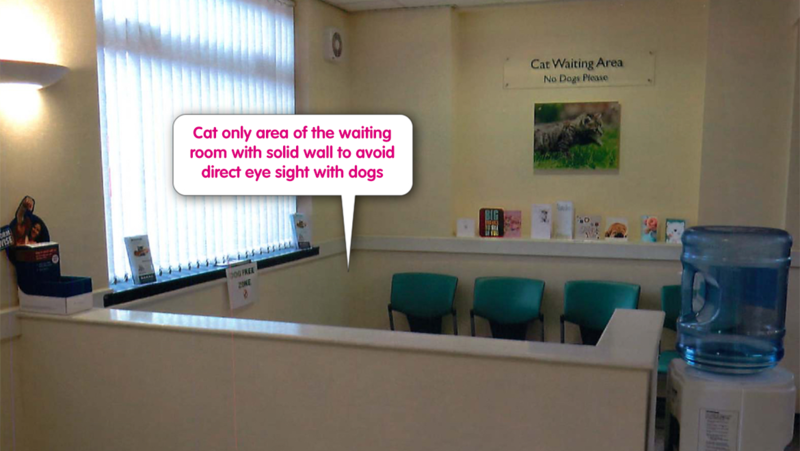 If a cat is becoming particularly stressed in the waiting room, having an empty consultation room into which the cat and owner can go is an advantage, but this should not be the only way of separating cats and dogs in the waiting area. 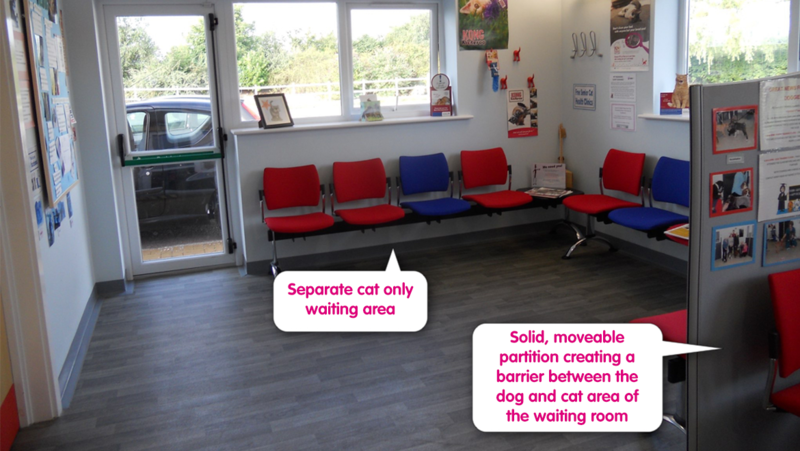 In some situations, a clinic may be able to have an entirely separate cat waiting room – this is an ideal situation but still needs additional thought about the layout. It is important that cats in their carriers should not routinely be placed on the floor. This may be unavoidable on occasions or for very short periods of time, but should never be the routine. 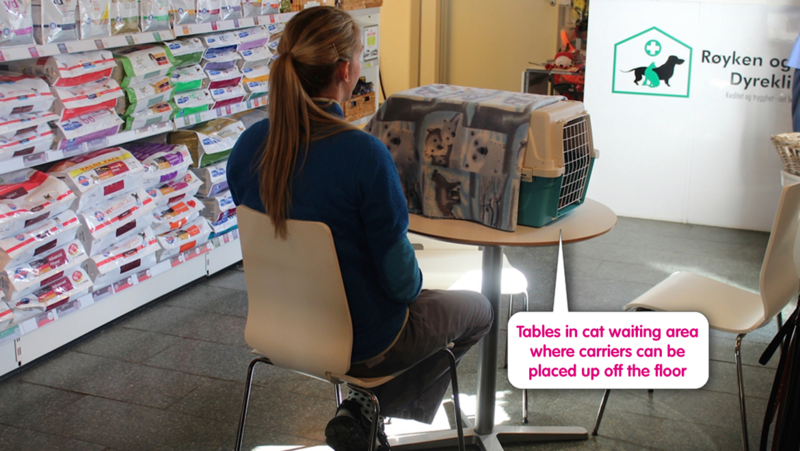 As a minimum, cats in their carriers can be placed on a seat or on a bench alongside the owner (or even on the owner’s lap if they are willing). 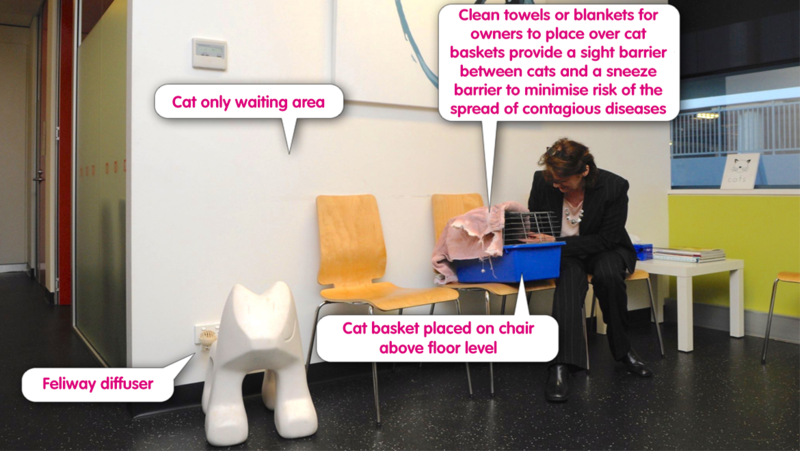 Ideally though, to enhance the cat’s feeling of safety, facilities should be available to raise the cat even further off the ground. Having a strong shelf or unit on which to place carriers, with solid vertical barriers in between, is ideal and this could be placed 1m or more above the ground. 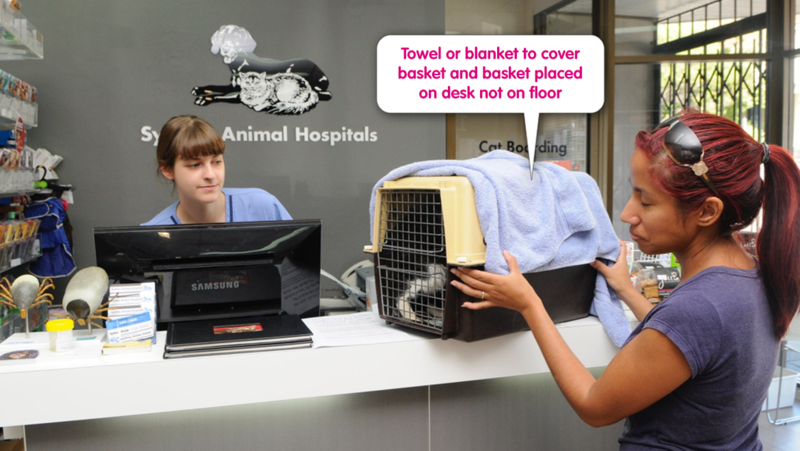 If it is not possible to have solid barriers between cat carriers when owners are waiting with their cats and there is more than one cat present (eg, if owners are sitting on a bench with the carrier next to them), eye contact between cats can be avoided and a sneeze barrier created by having a supply of clean blankets or towels that an owner can be asked to place over the carrier. 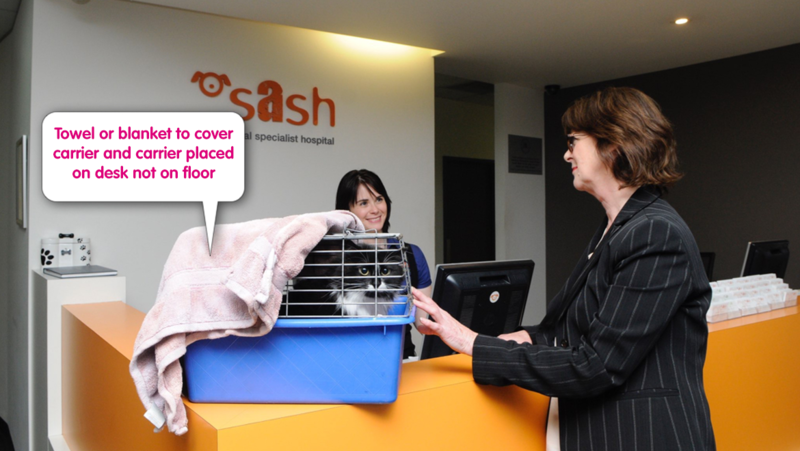 When owners need to speak to a member of staff at the reception desk, this sometimes means the cat has to be placed in its carrier on the floor. This is not good for the cat and may significantly enhance its feeling of vulnerability and anxiety. 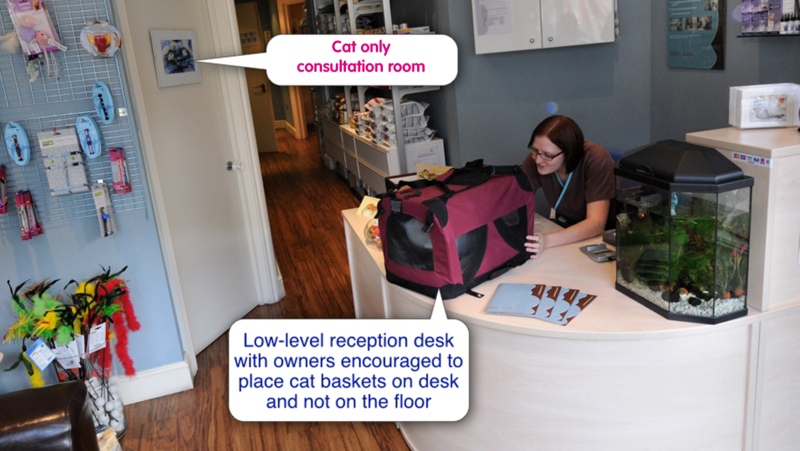 Having a low-level reception desk – or an area that is at a lower level – would provide an opportunity for cat carriers to be placed on the reception desk itself. 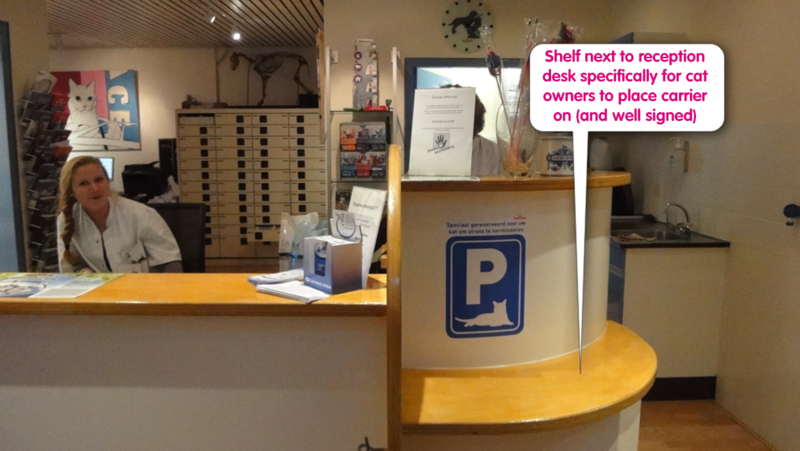 Alternatively a shelf may be provided next to the reception desk to temporarily place the cat carrier on and cat owners can be encouraged to use this. 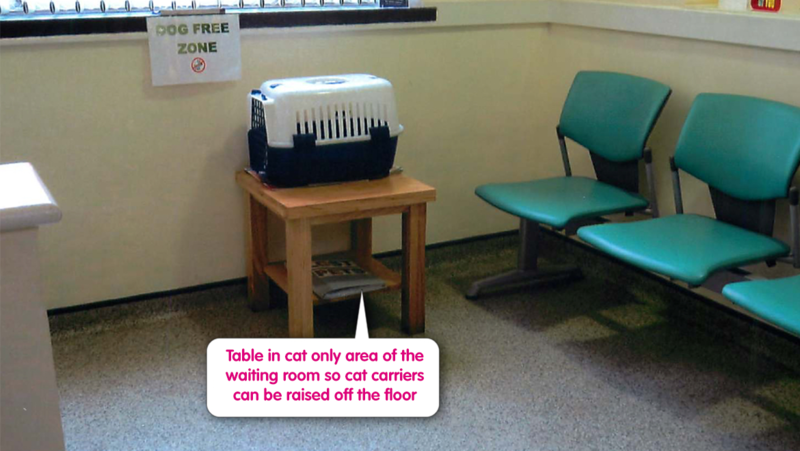 Feliway® Classic diffusers may be a useful addition to the waiting room – if used along with other measures to make a waiting room cat friendly they may help reduce cat stress.